A new study shows that the type of hand drying method available in washrooms affects the amount of bacterial contamination in the room. More specifically, the presence of antibiotic-resistant bacteria (e.g., MRSA, MSSA, ESBL-resistant enterococci) were detected more frequently in those washrooms with jet air dryers than in washrooms with paper hand towels. The 2017 study was led by Professor Mark Wilcox of the University of Leeds and Leeds Teaching Hospitals and conducted independently by research scientists at hospitals in France, Italy and the United Kingdom. "The findings will have important implications for hand drying guidance in healthcare settings and they should be of particular interest to infection prevention and control doctors and nurses, procurement managers and all responsible for minimizing the spread of cross-infection," said Wilcox. 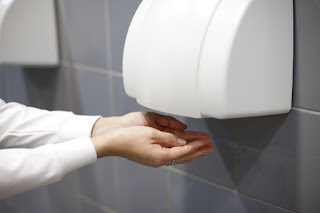 The study, "Environmental contamination by bacteria in hospital washrooms according to hand-drying method: a multi-centre study," was published in the Journal of Hospital Infection.